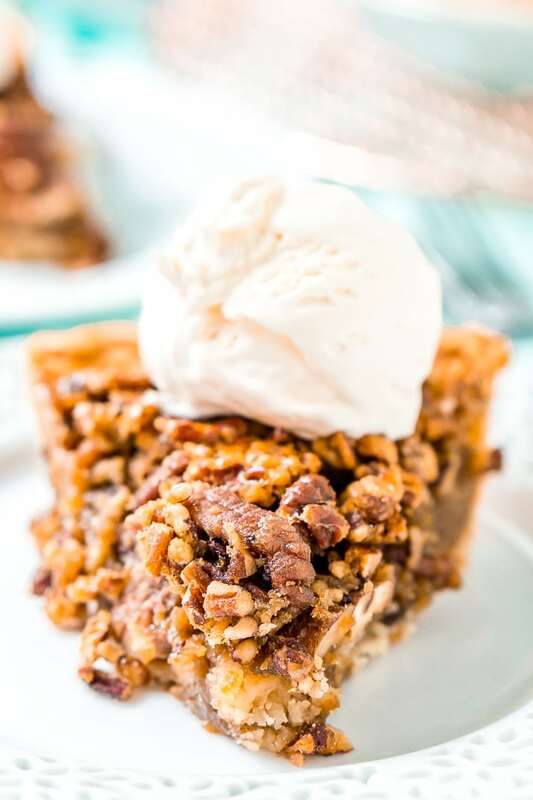 Pecan Pie is so simple to make and a delicious holiday pie the whole family will love! 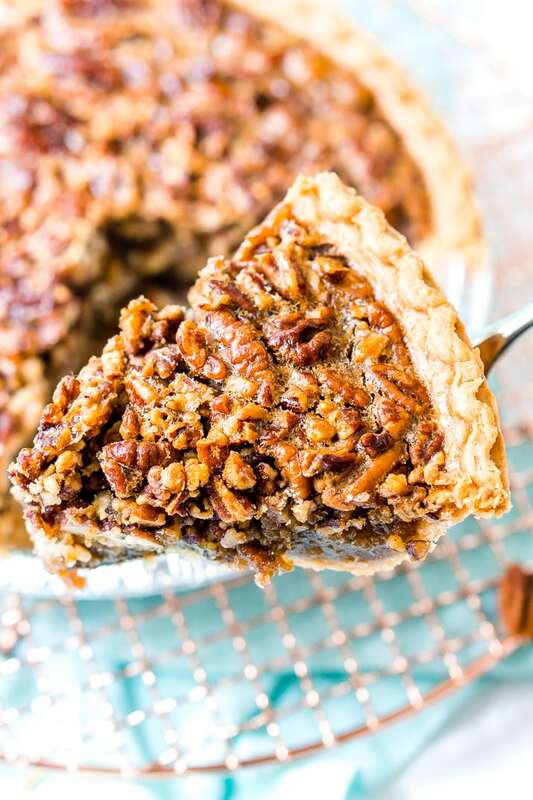 The sugar filling is loaded with pecans and nestled in a flaky crust and you can easily make it a day or two ahead of time! About a year ago, my mother passed along some of my Grammie’s old recipe cards. Among them was her recipe for a Kentucky Pecan Pie, something she had made every year at Thanksgiving, and something I had never tried. 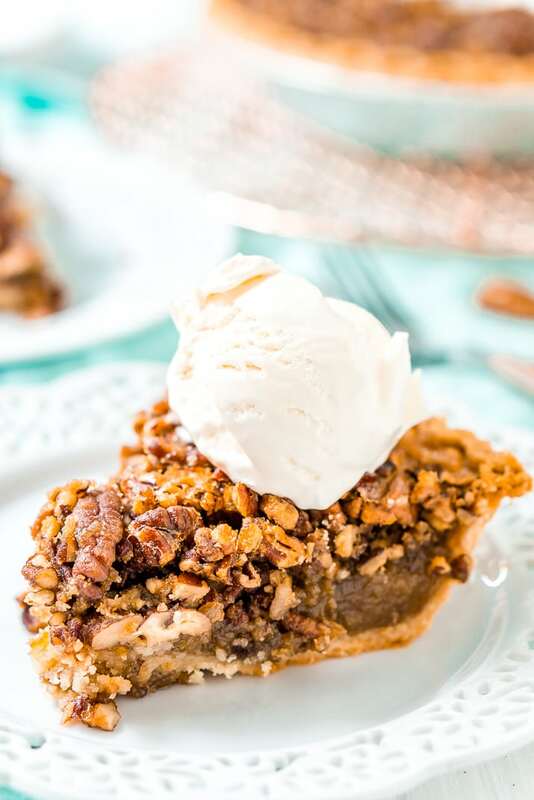 This Pecan Pie Isn’t Just Any Recipe! I prepared the pecan pie filling as if it was just an everyday recipe. I poured it into the crust, and then popped it in the oven. It was just another recipe. Or at least it was until I opened the oven about halfway through and the amazing aroma racked me with grief. I stood in my kitchen silently sobbing and fought every urge not to just sit down on the floor and let it all out. In fact, I’m having a hard time writing this now, days later, through tear-soaked eyes. I wasn’t crying because the pecan pie had failed, I was crying because it was just like hers. It was hers, and she’s not here to enjoy it with me. 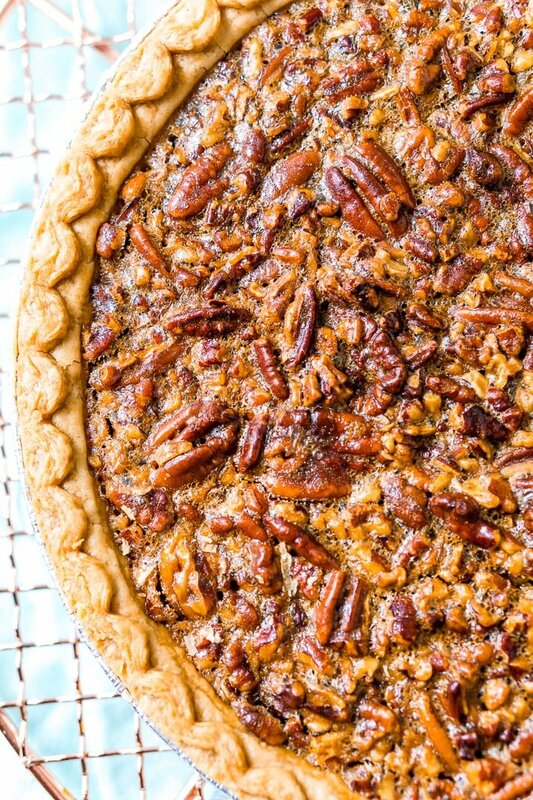 The fragrance of the rich brown sugar, warm pecans, and flaky crust sent me instantly back to my childhood. To Thanksgiving with my crazy-big family and a table lined with more pies than anyone could ever eat. And always baked to perfection! I could see myself walking around the corner into the kitchen to sneak pieces of extra pie crust my grandmother had baked up with cinnamon and sugar. I’m pretty sure she always knew what I was doing while she was back to mashing the potatoes. But not once at Thanksgiving did I try her pecan pie. And now, what I wouldn’t give to have not been so picky and to have shared a piece with her. And as I stood there, I came to realize, that somehow all these years later, she was actually sharing a piece of herself with me. It was then that my grief transformed into thankfulness. I’m so thankful that some of her recipes had ended up in my hands almost seven years after she had passed; and that even though I hadn’t gotten to share a piece of this pie with her, we must have split a million loaves of her banana bread when I was little. And most importantly, I know my passion for baking was born in her kitchen and it’s something that will always connect us. 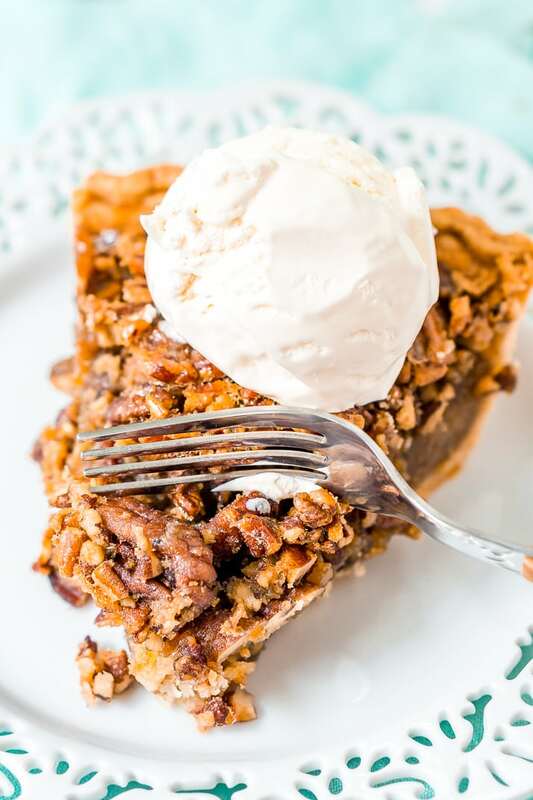 A Freshly Baked Pecan Pie Was Meant To Be Shared! So once the pie was done, I did what anyone would do and I drove to my Nana’s to share a piece with her. Then I took half the pie to my mom’s so she might feel that connection once again as well. I feel like this recipe found me at the right time, I don’t want anymore missed moments. I want to be present in my family so that years from now I can smile back on a shared plate of pecan pie. It’s so easy to get caught up in the things that don’t matter, so I encourage you to slow down and take in the things that do. I hope you all find some time this holiday season to bake together, play together, and eat together. Just BE together, I promise you’ll be so glad you did. 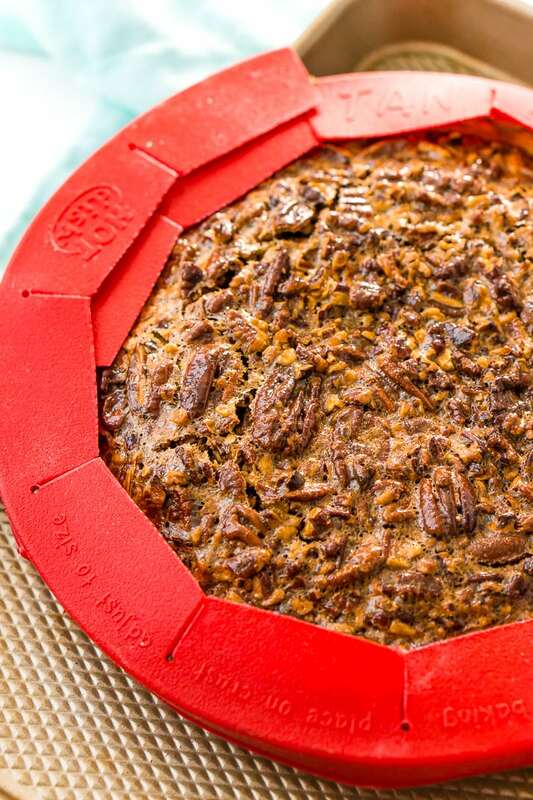 Using All Brown Sugar Makes This Pecan Pie Amazing! My Grammie’s Pecan Pie is different because it uses all brown sugar which really lets the pecan flavor shine. She also always cooked part of the filling on the stovetop before combining everything and adding it to the pie crust. Most pecan pies don’t use this method and I’m honestly not sure why she did it, but I do know that you don’t mess with perfection. My Grammie always made her pie crust from scratch. However, it’s something I have never been good at and it’s one of her recipes I still haven’t been able to find. So feel free to use your go-to pie crust be it homemade, refrigerated, or frozen! I always thought pecan pie was hard to make, but it’s actually really simple, follow the steps below for a perfect pie! Preheat oven to 350 degrees F and prepare your crust in a 9-inch pie dish and set aside. In a medium saucepan, combine syrup, sugar, butter and cook over medium heat until the butter has melted, stirring frequently. In a small prep bowl, stir together the water and cornstarch. Add it to the butter mixture along with the vanilla and salt. Bring the mixture to a rolling boil and remove from heat. Add the eggs to a large bowl or stand mixer fitted with a whisk attachment and beat just until frothy, about 1 minute. Slowly add in butter mixture while beating on medium speed to incorporate the two together and prevent the eggs from cooking. Add in the pecans and mix to combine and pour into the prepared pie shell. Bake for 45 to 50 minutes. Check halfway through and if the crust is starting to brown, loosely cover with aluminum foil or a crust guard. Remove from oven and place on a cooling rack to cool completely. Serve with whipped cream or ice cream. This post was originally published in November 2015 and was updated in October 2018 with new photos and a slight recipe adaptation. 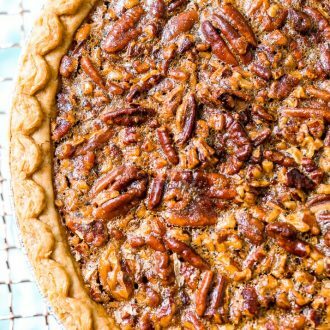 This Kentucky Pecan Pie is a family recipe that's softer than most with a great balance of sugar, pecans, and crust. Slowly add the butter mixture while beating the mixture on medium speed to incorporate the two together and prevent the eggs from cooking. Hugs to you, Rebecca! I love having my grandma’s recipes, too. Both my grandma’s are still with me, but they don’t bake anymore at all. Passing on their classic recipes to my kids is priceless! This pie is gorgeous. And those little maple leaves on that crust…perfect!! Thanks so much, Julie. It really is wonderful how so many memories and love can be passed down on these little index cards! Thank you for sharing, I’m glad I read the story before printing the recipe. Now our hearts are ALL connected. The reason for the cooking before baking is to thicken the filling and heat it up so that it bakes evenly without raw spots. 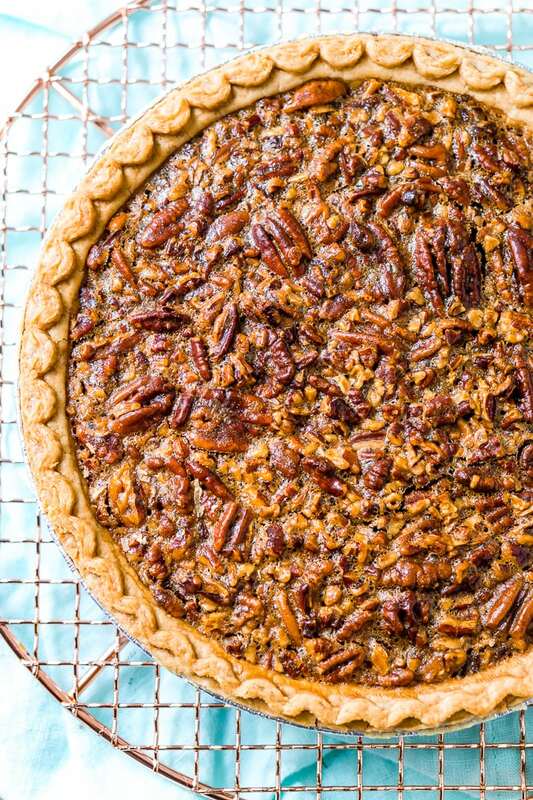 Other pecan pie recipes rely on the thickness of corn syrup, you’re basically making your own “syrup” this way. I can’t wait to give this a try this week!! Thank you, Jan! I appreciate you explaining that and it makes perfect sense! I hope you enjoy this pie as much as I do!